Over time numerous design proposals had been made for a bridge connecting Washington D.C. with Arlington Memorial Cemetery. 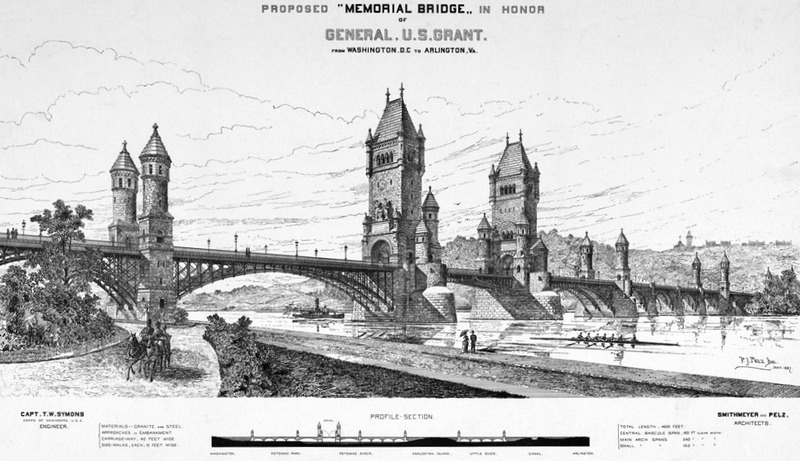 In 1887 architectural firm Smithmeyer & Pelz proposed a bridge in honour of General U.S. Grant, featuring medieval-looking towers and turrets, la bit like the London’s Tower Bridge, which was designed in 1884. Actually this was their second proposal, the first plan was a bit more modest. Finally in 1932 the present low-to-the-ground Memorial Bridge was opened. The designs are part of the new exhibit at the National Building Museum: ‘Imagine Washington D.C. as it could have been’. I've traveled over the bridge today numerous times, but I was unaware of earlier proposals. I'm glad they didn't go with the 1887 proposal, it would have been a bit out of place with most of the city's structures. The first proposal would have probably worked, but the current design I think is best. I agree with Nate! The rejected design looks a lot like the Smithsonian Castle on the Mall. I much prefer the design they chose..